China has been running down its vast foreign currency reserves in an attempt to boost the value of its own currency and stem a flow of funds overseas. 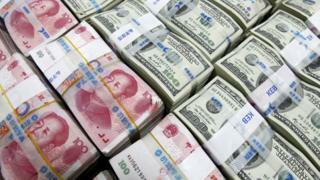 At $3.23 trillion, China still has the world's biggest reserve of foreign currency holdings. But that has declined by $420bn over six months and stands at the lowest level since May 2012. "While the remaining reserves still represent a substantial war chest, the mathematics around this rapid pace of depletion in recent months is simply unsustainable for any length of time," said Rajiv Biswas, Asia Pacific Chief Economist, IHS Global Insight. The Chinese authorities fear a rapid devaluation of their currency, as it could destabilise the economy. So China has been trying to engineer an ordered devaluation of the yuan, but that is proving hard to deliver. To stabilise the situation China has been selling dollars and buying yuan. And it has been using other tactics, including curbing currency speculation and ordering offshore banks to retain their reserves of yuan. Commenting on the decline, veteran economist, George Magnus noted that there is "confusion" over China's foreign currency policy. "Clearly this can't go on for long," he tweeted, referring to the fall in currency reserves.